Once he began sleeping long stretches my workouts were able to be kicked up another notch. Prior to six months he was still waking up at 11:30pm and 5:30 in the morning. Though that is of course normal for a 3-6 month old, it was far from normal for me! My normal relentless style of training was very difficult to attain on a broken sleep schedule, so once he hit 6 months, Mama officially got her workout groove back! I did notice some lower back sensitivities which is common in moms and dads with small children. The constant carrying, feeding, bending over, lying on the floor for play time, lack of sleep, and maybe poor nutrition certainly does not help Mommy and Daddy’s posture. Strengthening your back and stretching your chest is something I emphasize in all my programs. I love TRX rows, bridges, and supermans to help strengthen this weakened area and lying face up on a stability ball will help lengthen the overly tighten chest area. Do not for that focusing on core and posture will also help alleviate pain. Thinking about sitting up straight, hydrating, and getting sleep ( if your baby allows) are all things that will make major differences. 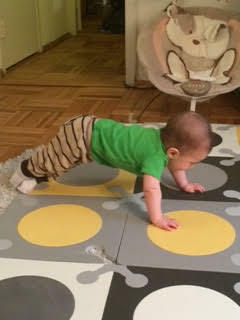 My BYOB classes have helped immensely in this regard, with “Mommy focused” exercises, and the capacity to bring Auggie along, the entire set up is a dream come true. Now on to the real star of the show, the man himself. As far as Auggie’s developments go he has started eating solid peas, sweet potatoes, carrots, bananas, avocados, hummus, apples, and the like. He was really not a fan of peas so they’ve been cut out of the rotation for now. I’ve been working on concocting homemade, organic baby foods, which surprisingly, isn’t as time consuming as you might think, and I feel better knowing exactly where his food came from. (More on that to follow!) I am still pumping three times a day, and he is officially only on bottles. As it turns out, at his 4 month appointment he had not gained the recommended amount of weight, so I’ve started counting ounces as well, just for extra assurance. So pumping is still a part time job, but I’ve been lucky that I still can, as I know the transition can be difficult for some mothers. Lastly, he’s mobile! 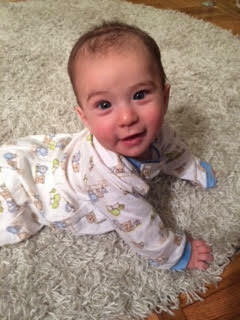 Auggie is crawling which means that time is officially flying by. He’s also saying “DaDa”, much to Geraldo’s delight. I have no idea where the last six months have gone. Every day we learn something new about this tiny human and the person he is becoming. It is the most amazing ride, and I can’t wait to see what it has in store for us!